BRAND NEW CONDO at Elkstone 21! Elkstone 21 is located 100 yards from a private ski easement, giving us this home great ski access to Chair 10. Our location still shines in the summer, surrounded by hiking and mountain bike trails. Fully equipped kitchen, beautifully furnished through out, with ski lockers, heated garage parking and a common hot tub. Step directly into your unit. No hallways and no walls are shared with other units in the building. Master bedroom has a King bed and flat panel TV. The attached bathroom has a large shower, separate jetted tub and double sinks. Guest suite has a King bed and flat panel TV. The attached bathroom has a tub/shower and double sinks. The third bedroom is the Queen bed, Attached bath with large shower. There is a sleeper sofa in downstairs media room that sleeps 2. There is a half bath off of the main living area as you enter the home and another half bath downstairs off of the lower living room. 3 Bedrooms, 3 Full Bathrooms, and 2 Half baths, Sleeps 8 - Great ski access - 100 yards away. 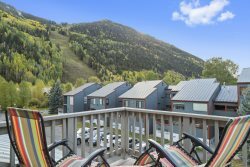 Luxury condo located adjacent to the Lower Double Cabins ski run. Couldnt have been happier. Top notch customer service, lovely staff, and high end amenities in the property. The home was beautiful--exceeded all expectations. It was equiped with everything we needed. The staff who met us soon after we were in the house was the friendliest, most knowledgeable I've ever encountered. He was extremely helpful. A maintenance issue with the door was repaired without us asking. Thank you so much! Great property. Clean, modern and warm. Everything was wonderful. Your property was beutiful, cozy and comfortable. Your customer services was always kind and helpful.